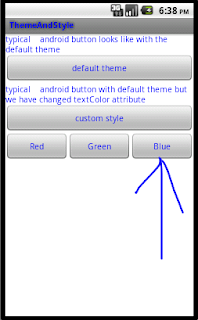 This post is a continuation of android themes and styles part I and II. 2. Reference a theme from code, I assure you, I also thought it’s so obvious. Notice how we have referenced our onclick handler from xml, onClick is a method we shall create in our main Activity class. We now go to ThemeAndStyleActivity.java and edit for new functionality. · When referencing a system theme in code, we append the android namespace (check the last “if” block) unlike a custom theme. 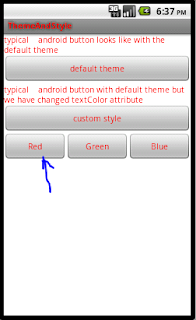 You are now very clear about loading themes dynamically, next we shall cover colors .xml in android and how separating colors from styles is very helpful. Just as we created styles.xml and themes.xml in the res/values folder, color definitions are no different, only that the styles element in the xml is replaced by color and the value is a hex color reference starting with #. 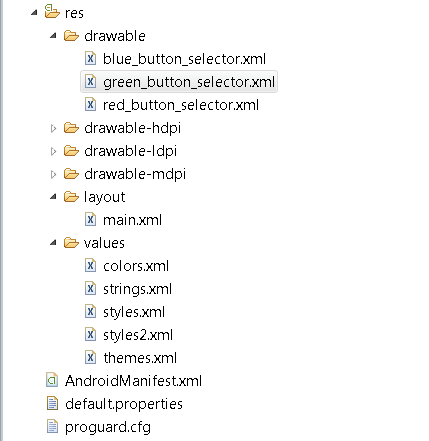 I hope the pattern is very clear since it resembles that of styles.xml which we already covered. 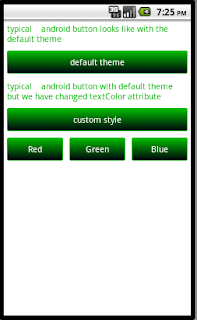 Since we are all about demonstration, this is a miniature version of a typical colors xml in a major application. To get a more complete list, please check out this stackoverflow question. We have even made our code more maintainable by using color references rather than explicit values. This is another classic example of separation of concerns, very important in developing software. You can reload your app and test that nothing has changed since we have simply moved our colors from the styles xml to their own file and called them by reference. Nothing changes. expression refers to the file name. The above statement means that even if colors.xml file was called mykala.xml or the styles.xml file was called mystyles.xml but the contents remained the same, it would not matter. You might have observed that all our demonstrations on color and themes have been leaving out the Button view. I intended this. You see, we have been talking about simple colors and then there are complex colors. You can understand this better with the example we are going to see shortly. If we had given our buttons a plain background color say green or red, they would have looked clumsy. We all know that at one point you may click a button to execute a function. Imagine clicking a button and you don’t see any difference in the way it appears, you don’t know if it responded to your click or if there is actually something happening in the background. So usually, to make our apps more responsive, we have to cater for state transitions in such clickables as buttons. Meaning if a button is green in color, when I click it and at the instant of clicking it appears light green and then on releasing, it returns back to the original green, I as the user will know something is happening. This is called “making the UI responsive”. We can achieve this in android using complex colors. Having understood the fundamentals of complex colors, we can now make the buttons participate in the theming party. Previously, we have been making all our texts correspond to the theme color. Since we are going to color the button backgrounds as well, we may not be able to read the texts on them like that, so let’s start by changing the button text colors. 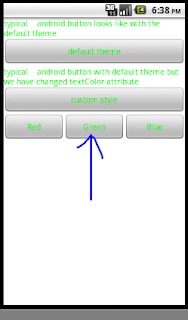 Go to styles2.xml and change the text colors to black. If you have never dealt with drawables before, just take it easy, I have posts prepared already to tackle them indepth. Everything else you can ignore for now incase you are not yet familiar with them. 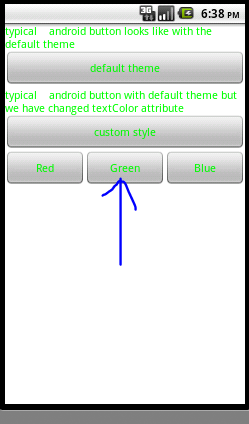 Now you have a comfortable grip of themes and colors in android. In the next tutorial, I will be covering android drawables.